Herbs are easy-to-care-for plants that are often adapted to poor or rocky soils in their native habitats. However, heavy clay soil and other soils that remain wet at all times are not the preferred soil types for herbs or most other plants. With just a little knowledge and work, you can ensure that your herbs will grow well and thrive. Although most herbs are adapted to many types of soil, from sandy to loamy, heavy clay soils that drain poorly are not considered good growing environments for herbs, according to the West Virginia University website. Dig out the soil in a wet area down to 18 inches deep and then line the bottom of the hole with 3 inches of gravel or other small stones. Then mix the removed clay soil with small amounts of compost, peat moss and sand and replace this better-draining mixture into the planting area. Don’t use too much organic matter, because herbs prefer nonfertile soil. 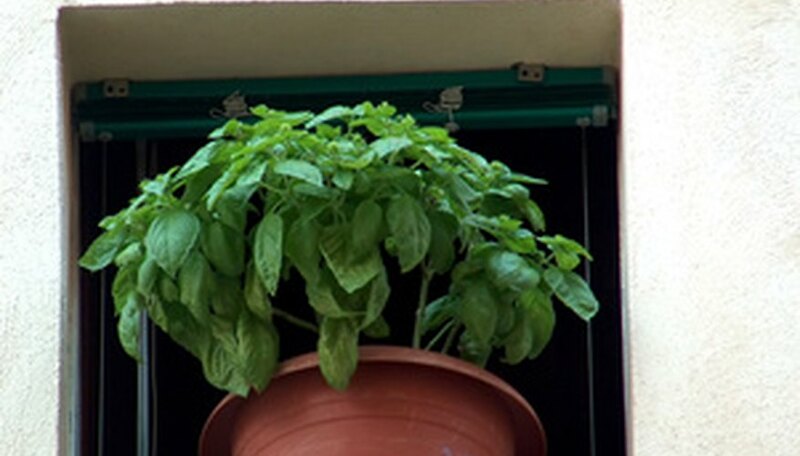 One of the benefits of growing herbs is that most do not require fertile soil or frequent applications of fertilizer. If the soil in your herb garden has a significant amount of organic matter, such as compost, grass clippings, fallen leaves and other plant materials, the fertility these substances give the soil can result in superfluous foliage and poor taste, according the West Virginia University website. Herbs that are exceptions to this rule include chervil, lovage, fennel and summer savory. West Virginia University recommends adding a few buckets of peat moss or compost to each 100 square feet of growing area for such herbs. Herbs are good choices for pots and other containers because they are typically small plants that don’t require deep soil for their root systems. Any standard potting soil is appropriate to use for potted herb plants because it contains shredded bark or wood, peat moss and sometimes other ingredients that are added to give plants drainage and nutrition. Make certain your container has at least one drainage hole because herbs can die if their roots remain wet at all times. A few rocks can help improve drainage in areas where herb plants grow. Dry, rocky soil can be a conducive growing environment for many herbs because these conditions often occur in nature where the herbs grow wild. Some herbs can grow out of seemingly solid rock. Examples include mullein, lemon basil and Madagascar periwinkle. If your soil is rocky, add topsoil and a bit of compost to improve the texture and give the area more nutrients, but too much soil fertility is not usually necessary for most herbs. If soil is overly acidic or alkaline, herbs can suffer. Conduct a soil test before you plant your herbs to determine your soil’s pH. If the reading is between 6.5 and 7.0, your soil is considered neutral and most herbs will do fine. However, if it is over 7.0 it is considered alkaline. To correct this situation, dig in 4 oz. of sulfur for every square yard of planting area. If it measures below 6.5, it is considered acidic. To correct this situation, add an acid-based fertilizer or 8 oz. of hydrated lime for every square yard of planting area.